Includes writing JavaFX applications and also serves as a convenient reference to some of the more advanced APIs in JavaFX 2.0. ► What is Java FX? JavaFX is an exciting new platform for building Rich Internet Applications with graphics, animation, and media. Starting with JavaFX 2.0, all the APIs are written in pure Java, which lets you write JavaFX applications directly in a language you are already familiar with. This Refcard will help you get started writing JavaFX applications and also serve as a convenient reference to some of the more advanced APIs. If you are new to JavaFX, the easiest way to get started is to download the NetBeans bundle. This gives you full IDE support for writing JavaFX applications out of the box, including library setup, deployment options, and an integrated UI debugger. However, it is possible to do everything from your favorite IDE, such as Eclipse or IntelliJ, or the command line directly. For the JFXPoetry theme, we will use "Pippa's Song", a well known excerpt from Robert Browning's Pippa Passes. The start method is guaranteed to be called on the JavaFX UI thread, so you can take care of scene graph manipulation and finally show the Stage when you are ready. Compiling and running this application will create a window with the title "Pippa's Song by Robert Browning" as shown in Figure 1. The JavaFX scene graph is an extremely powerful concept, which can be used to apply transformations and effects that change the rendering of all the child nodes. Image image = new Image("http://farm1.static.flickr. Notice that to add the Image element to the root StackPane, you must first get the list of children and then add an element. This is a common pattern used throughout the JavaFX APIs that is possible because of Observable Lists where any change to the list contents is automatically updated in the UI. For the background image, we have chosen a picture of a misty morning in Burns Lake, BC, Canada taken by Duane Conlon. The running example can be seen in Figure 2. Displaying Text in JavaFX is as simple as constructing a Text Node and passing in a String to the constructor. There are many properties available on Text; however, for this example, we will set the font and fill color and add a Drop Shadow effect to make the text stand out on the background. By using the cache property on Node, you can improve performance and avoid rendering artifacts during animation. To create the DropShadow in the above code, we chose to use the builder syntax, which is a fluent API for creating JavaFX UI elements. Every JavaFX class has a builder peer that can be used to set properties by chaining method calls and will return an instance of the class when the final build method is invoked. This allows us to change the radius and spread properties of the DropShadow in order to accentuate the letters. Figure 3 shows the updated example with Text overlaid on the Image. JavaFX offers a large set of graphics effects that you can easily apply to nodes to create rich visual effects. Table 1 lists all the available effects you can choose from. Shadow Similar to a DropShadow but without the overlaid image. Every JavaFX class has a matching builder, which you can use to make your code more readable when setting multiple properties. By setting an interpolator of EASE_OUT, the text will start at full speed and gradually deaccelerate as it approaches its destination. To run the transition, all you need to do is call the play() function, which will animate the text as shown in Figure 4. The JavaFX 2 release features a complete library of skinnable controls that give you everything you will need for most web and business applications. Table 3 lists some of the controls and what they can be used for. Accordion The Accordion control lets you display a list of nodes that can be expanded by clicking the title. Since the title and content areas are both JavaFX nodes, you can embed images, controls, and even media in the accordion. Button JavaFX buttons are extremely versatile and have complete control over all aspects of style including color, text, shape, and even images. CheckBox The CheckBox control is a specialized type of button that includes a label text and a check selection area that can be checked, unchecked, or indeterminate, allowing for tri-state behavior. ChoiceBox A ChoiceBox allows selection from a list of pre-defined items using a drop-down menu. This control supports a null (or undefined) state and sets the selected item to something that is not in the list. Hyperlink Hyperlinks are a special type of button that mimic the behavior of a hyperlink in a web browser. This includes rollover animation and a special style for visited links. Label A label is a basic control for displaying read-only text. It supports ellipses for content that is too long to be displayed and keyboard mnemonics for creating accessible UIs. ListView The JavaFX ListView lets you display a vertical or horizontal list of items and is backed by an Observable List that will update automatically update the UI when the contents change. You can display Strings or any other type of object in a List by providing your own cell factory that converts objects into JavaFX nodes for display. Also, the list control supports single selection or multiple selection and lists where you can edit the contents inline. ProgressBar The ProgressBar control gives feedback during long-running operations using a horizontal progress bar. This can either be as a percentage of complete when the duration is known or an indeterminate animation. ProgressIndicator The ProgressIndicator control has the same functionality as the ProgressBar, except it displays the progress either as a small pie graph or an indeterminate spinning animation. RadioButton The JavaFX RadioButton behaves like a two-state checkbox when used alone, but it is more commonly added to a ToggleGroup where only one of a set of radio buttons can be active at a time. TableView The TableView is a very powerful table component for JavaFX that supports a two-dimensional grid of cells with column headers, column resizing, column reordering, multi-column sorting, nested columns, cell spans, editable cells, and many more features. TabPane A TabPane displays a list of Tabs, only one of which can be active and displayed at a given time. The list can be positioned along the top, left, right, or bottom of the content area. If there are more tabs than fit, they will be displayed in a drop-down menu. JavaFX provides a complete set of editable text area controls, including a basic one-line TextField, a multi-line TextArea, and a specialized PasswordField that masks characters as they are entered. TreeView The TreeView shows a hierarchical view of TreeItems with controls to allow each level to be expanded in place. To create a TreeView with multiple top-level nodes, you can set showRoot to false, which will hide the top-most element of the model. Like the ListView control, it supports custom cell factories to display different content types inline. In addition to these controls, JavaFX also supports a ScrollPane, Separator, Slider, SplitPane, Tooltip, Menu, and HTMLEditor. All of the JavaFX controls are fully skinnable, allowing you to customize the look and feel to match the design of your application using CSS or a custom Skin class. The simplest control to use is a Button, which can easily be scripted to play the animation sequence again from the beginning. Adding a button to the scene is as simple as calling the constructor with the button text and adding it to the list of children. To automatically hide the button while animation is in progress and show it after the animation completes, we make use of binding, a very powerful JavaFX feature that is exposed via a new set of APIs in JavaFX 2. By binding the visible property of the button to the animation status of the translation transition, the button will be shown as soon as the animation finishes. Binding is a great alternative for event listeners and callbacks, because it allows you to create dynamic content with very little code. Following this, we make use of an ActionEvent handler to play the animation and the media from the start, which is triggered once the button shown in Figure 5 is clicked. The finishing touch is to add some audio to the scene. JavaFX has built-in media classes that make it very simple to play audio or video either from the local files or streaming off the network. To complete the example, we will add in a public domain clip of Indigo Bunting birds chirping in the background. Adding in the audio is as simple as creating a Media object with the source set to the URL and wrapping that in a MediaPlayer with autoPlay set to true. Besides loading media off a network, you can also access local files or resources in the application jar. In this example, we are using an mp3 file, which is supported across platforms by JavaFX. Table 3 lists some of the common media formats supported by JavaFX, including all the cross-platform formats. 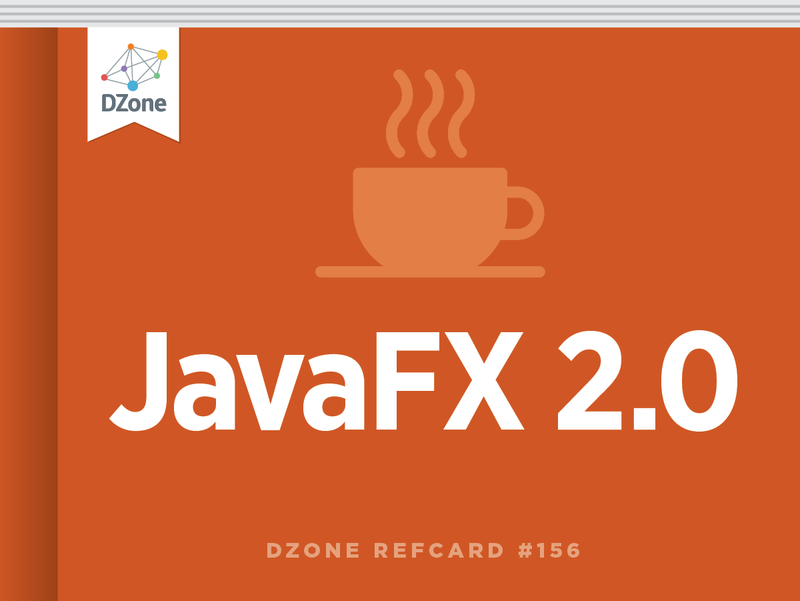 Note: This Refcard covers the latest changes through JavaFX 2.0.3. In addition to what is mentioned here, Oracle has announced support for AAC audio and H.264 video coming in JavaFX 2.1. In addition to writing applications in pure Java, JavaFX also supports a declarative markup format called FXML. Additionally, JavaFX lets you use CSS (cascading style sheets) to define control and component styles. The combination of FXML and CSS allows you to specify your user interface in a declarative and designer-friendly format while keeping your application logic in the Java language. Notice that the element names match the JavaFX classes and that the attributes align with the properties of those classes. For complex types, you can instead specify them as nested elements, which allows you to create the scene graph hierarchy declaratively and specify complex types such as Images. The variables annotated with @FXML will get their values injected by the elements in the FXML file with the matching fx:id tags. Any method in the controller can be hooked up as an event handler, which is demonstrated by the replay method that is wired up to the onAction event of the button element in the FXML. Finally, you can override the initialize method to do application setup after all the variables have been initialized, such as setting up the transitions, binding, and media for this poetry example. JavaFX stylesheets are based on the W3C CSS2.1 specification with some additions inspired from CSS3. In addition, many JavaFX-specific properties are exposed by prefixing the property name with "-fx-", as shown in the above example to set the font size, fill, and drop shadow effect. In addition, the above CSS includes a new styling for the "Play Again" button so it matches the overall theme of the application better. Notice that the FXML loader expects a URL, while the stylesheet list on Scene is of type String. To convert a URL to a String for the stylesheet, you can call toExternalForm to get the correct URI syntax for the resource you are loading. Upon running you can see the new CSS button design as shown in Figure 6. An easy way to view and navigate the full JavaFX API is to use the Ensemble sample application. This comes with the JavaFX SDK and can be launched by double clicking the Ensemble.jar in the samples folder. Figure 7 shows what the Ensemble application looks like when you first open it. Ensemble comes with live code samples of all the major features of JavaFX as well as an inline API documentation viewer, which makes use of the new WebView component that provides a full-featured, embeddable browser that you can use in your own applications. JavaFX Charts Look Pretty Good! For the JFXPoetry theme, we will use \"Pippa's Song\", a well known excerpt from Robert Browning's Pippa Passes. The start method is guaranteed to be called on the JavaFX UI thread, so you can take care of scene graph manipulation and finally show the Stage when you are ready. Compiling and running this application will create a window with the title \"Pippa's Song by Robert Browning\" as shown in Figure 1. JavaFX stylesheets are based on the W3C CSS2.1 specification with some additions inspired from CSS3. In addition, many JavaFX-specific properties are exposed by prefixing the property name with \"-fx-\", as shown in the above example to set the font size, fill, and drop shadow effect. In addition, the above CSS includes a new styling for the \"Play Again\" button so it matches the overall theme of the application better.